coverage of the Brussels Convention on Jurisdiction and Judgements. Each chapter covers a separate aspect of contract relations. The chapters dealing with specific obligations imposed by EC legislation cover a diverse range of contract contexts: commercial, employment, consumer, banking, and public contracts. This book's content reflects, as closely as possible, the precise wording of the EC legislation together with the exact wording of any relevant European Court of Justice holdings, as set out in the Official Journal and in the European Court Reports . Correspondingly, this French edition is based on the applicable official texts in French, the Journal Officiel , and the Recueil. 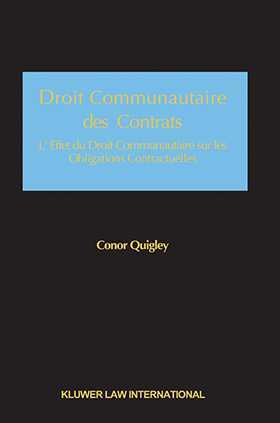 Droit Communautaire des Contracts provides comprehensive coverage in a straightforward, readable format, making it an extremely helpful work both for practitioners setting out to interpret or draft a contract and for academics examining the legal approach to contract evaluation or enforcement.